2,049nm from Dubai Heading: 178° The Seychelles offers a refreshing new horizon to visiting superyachts that want to cruise the archipelago and experience the extraordinary, such as the islands’ rare fauna and Aldabra giant tortoises. With some of the best beaches in the world and a famous reputation as a relaxing haven, the Seychelles is a go-to luxury destination. But you’ll need a stable yacht to explore the 155 islands properly – Desroches Island, which boasts 14km of pristine beaches and clear waters, is poorly protected from wind and swell. Only a yacht like the Sanlorenzo 460EXP, with her dominant seafaring ability and solid stability, will allow you to probe this destination in luxury. 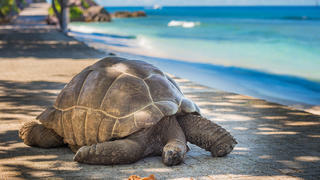 The Seychelles offers a refreshing new horizon to visiting superyachts that want to cruise the archipelago and experience the extraordinary, such as the islands’ rare fauna and Aldabra giant tortoises. With some of the best beaches in the world and a famous reputation as a relaxing haven, the Seychelles is a go-to luxury destination. But you’ll need a stable yacht to explore the 155 islands properly – Desroches Island, which boasts 14km of pristine beaches and clear waters, is poorly protected from wind and swell. Only a yacht like the Sanlorenzo 460EXP, with her dominant seafaring ability and solid stability, will allow you to probe this destination in luxury. 1,067nm from Singapore Heading: 327° If you want to experience a genuinely virgin, uninhabited land then Myanmar’s Mergui archipelago can’t be beaten. Home to the indigenous Moken tribe, the islands have been described as so remote it feels as if your group is the first to make landfall. As befits such a secluded destination, your time will be spent anchored off settlements rather than in marinas, which makes the self-sufficiency of the Sanlorenzo 460EXP especially appealing. 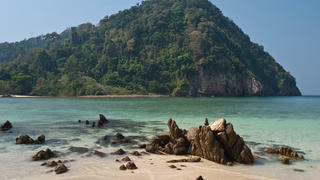 If you want to experience a genuinely virgin, uninhabited land then Myanmar’s Mergui archipelago can’t be beaten. Home to the indigenous Moken tribe, the islands have been described as so remote it feels as if your group is the first to make landfall. As befits such a secluded destination, your time will be spent anchored off settlements rather than in marinas, which makes the self-sufficiency of the Sanlorenzo 460EXP especially appealing. 2,311nm from Miami Heading: 196° Costa Rica offers some of the finest watersports in the world, and when you visit with the Sanlorenzo 460EXP you’ll be glad of her gargantuan aft deck and forward garage that can store a variety toys. This freedom means you can work your way up the west coast of Costa Rica as you stand up paddle along the Gulf of Papagayo, kite surf at Guanacasta and surf at Salinas Bay. For those who prefer to explore without the adrenaline rush, Cocos Island is an unrivalled expedition. This UNESCO World Heritage Centre is certainly hard to access, with just one visiting yacht permitted at a time, and has an interesting history with claims of piracy and buried treasure. Costa Rica offers some of the finest watersports in the world, and when you visit with the Sanlorenzo 460EXP you’ll be glad of her gargantuan aft deck and forward garage that can store a variety toys. 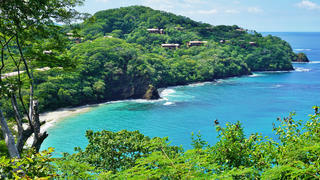 This freedom means you can work your way up the west coast of Costa Rica as you stand up paddle along the Gulf of Papagayo, kite surf at Guanacasta and surf at Salinas Bay. For those who prefer to explore without the adrenaline rush, Cocos Island is an unrivalled expedition. This UNESCO World Heritage Centre is certainly hard to access, with just one visiting yacht permitted at a time, and has an interesting history with claims of piracy and buried treasure. 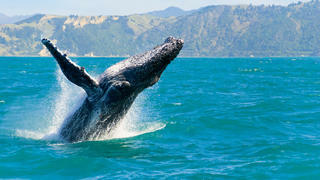 1,108nm from Cairns, Australia Heading: 317° The Raja Ampat archipelago is a diver’s playground. With over 1,500 small islands to explore, it boasts some of the clearest waters in the world and regularly tops lists of the best places to dive. Conscious superyacht owners will be keen to visit on a yacht that doesn’t negatively impact the environment, and the Sanlorenzo 460EXP is exactly that. Certified Green Plus by RINA, the yacht can also remain anchored without using her generators for long periods, which means the fish won’t be scared away by excess noise pollution either. And, of course, with plenty of space on board for a full dive center, you’ll be well positioned to exploit this rare opportunity. 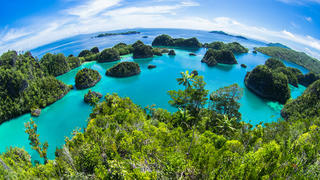 The Raja Ampat archipelago is a diver’s playground. With over 1,500 small islands to explore, it boasts some of the clearest waters in the world and regularly tops lists of the best places to dive. Conscious superyacht owners will be keen to visit on a yacht that doesn’t negatively impact the environment, and the Sanlorenzo 460EXP is exactly that. Certified Green Plus by RINA, the yacht can also remain anchored without using her generators for long periods, which means the fish won’t be scared away by excess noise pollution either. And, of course, with plenty of space on board for a full dive center, you’ll be well positioned to exploit this rare opportunity. 850 nm from Panama Heading: 308° At the Galapagos Islands you’ll see wildlife you can’t find anywhere else in the world, ranging from the giant Galapagos tortoise to the waved albatross and marine iguana. 97% of the territory is protected, and so anchorage options are limited. To make the most of a visit to the Galapagos Islands, a superyacht with a long range is essential. Aside from the Sanlorenzo 460EXP’s impressive 4,000nm range, it’s her ability to offer a luxury yacht experience for long durations without external support that will really wow you on this trip. At the Galapagos Islands you’ll see wildlife you can’t find anywhere else in the world, ranging from the giant Galapagos tortoise to the waved albatross and marine iguana. 97% of the territory is protected, and so anchorage options are limited. 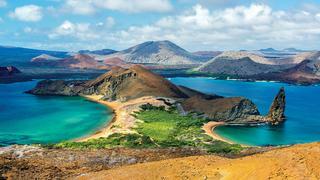 To make the most of a visit to the Galapagos Islands, a superyacht with a long range is essential. Aside from the Sanlorenzo 460EXP’s impressive 4,000nm range, it’s her ability to offer a luxury yacht experience for long durations without external support that will really wow you on this trip. 7,000nm from San Diego Heading: 145° Baja in Mexico offers much more than beach resorts – it’s the place where you can watch whales, go hiking or enjoy countless watersports. And for those who love to fish, Baja, which is a regular in the world record books for the largest fish caught, is a must-see. Thanks to her dedicated crane, the Sanlorenzo 460EXP can host a fishing boat on board, which means you’ll be able to enjoy this sportfishing opportunity to its fullest – but be sure to exercise caution as Mexico has strict fishing regulations and the waters are protected. Baja in Mexico offers much more than beach resorts – it’s the place where you can watch whales, go hiking or enjoy countless watersports. And for those who love to fish, Baja, which is a regular in the world record books for the largest fish caught, is a must-see. Thanks to her dedicated crane, the Sanlorenzo 460EXP can host a fishing boat on board, which means you’ll be able to enjoy this sportfishing opportunity to its fullest – but be sure to exercise caution as Mexico has strict fishing regulations and the waters are protected.